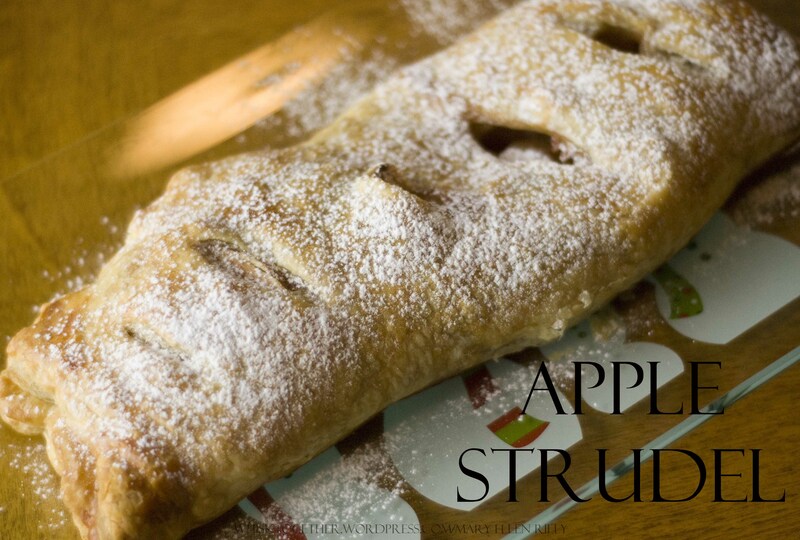 Having cherry pie, pumpkin pie, pecan pie, chocolate pudding pie, and every pie you can think of for Thanksgiving, I thought it would be fun to liven things up a bit and make an apple strudel instead. Just like apple pie – but in a rectangle. It’s is very quick and easy to put together as well. We all really enjoyed it. Ingredient notes: Granny Smith apples were listed in the original recipe and are very common in apple pies. I like their taste, but they also tend to get mushy. If you like that – use Granny Smith. An alternative would be Jonathon apples. They seem to have a similar tartness, but stay more firm in the cooking process. I’ve also been told by an apple pie winning expert that she uses Cortland and Empire apples in her pie. 1. Preheat oven to 375 degrees. In medium bowl, stir the sugar, flour and cinnamon together. Add apples to coat. 2. Get out the cookie sheet you will bake your puff pastry on. Put down a silicone mat or parchment paper if you want easy clean up. 3. 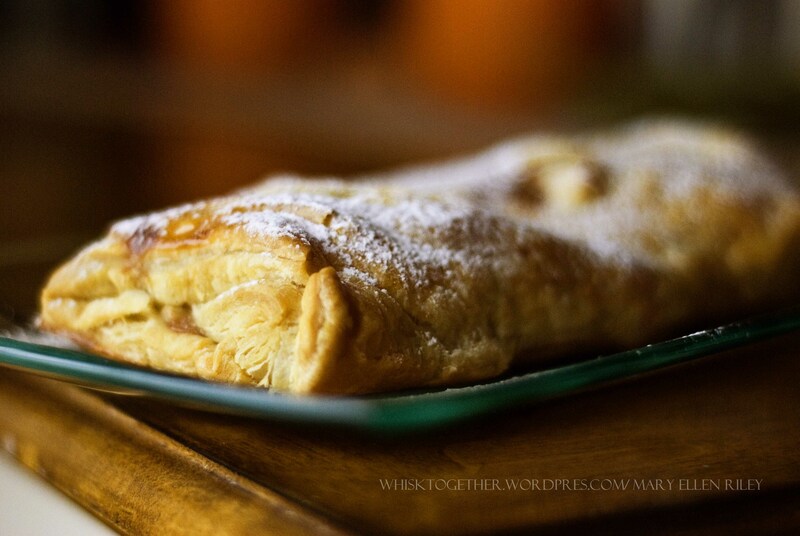 On the cookie sheet, roll the puff pastry into a 16×12″ sheet. Or get as close as you can to making the pastry sheet bigger. Mine ended up around a 12×12″ square almost. 3. Spoon the filling into one half of the pastry to within 1″ of the edge. Fold the pastry dough over the apples and tuck under (like a roll almost). 4. In a small bowl, mix the water and egg together. Brush this on top of the strudel. 5. With a sharp knife, cut slits in the top of the pastry about 2″ apart. Bake 35 minutes. 6. Cool completely and dust with powdered sugar.